this is real social justice. Don’t just sign a petition, or share s link, or attend a rally. If you have the wherewithal, commit to helping someone who suffering everyday. This is a reminder to those who read this, and to me as well. May Allah guide you and have mercy on you, and reward you for your good deeds and forgive you for your sins Amin! Allahu Akbar! 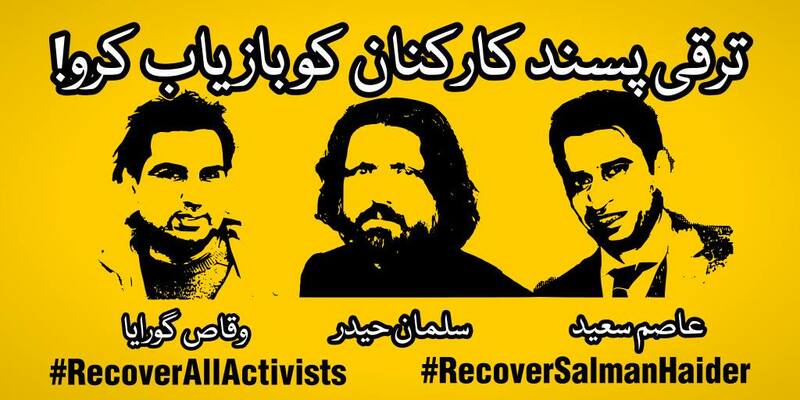 It is now more than three weeks since the professor, poet and activist Salman Haider was ‘disappeared’ from Islamabad. Shortly afterwards, more social media activists were picked up. By whom and why? Questions beg answers. Please sign the statement urging their safe return. I sincerely condemn the acts which lead to dissaperance of the activists and demand their safe returns. They are ray of hope against the insanity provoked by the Establishments in the name of Nationality and Religion. You are currently reading Recover Disappeared Activists at .